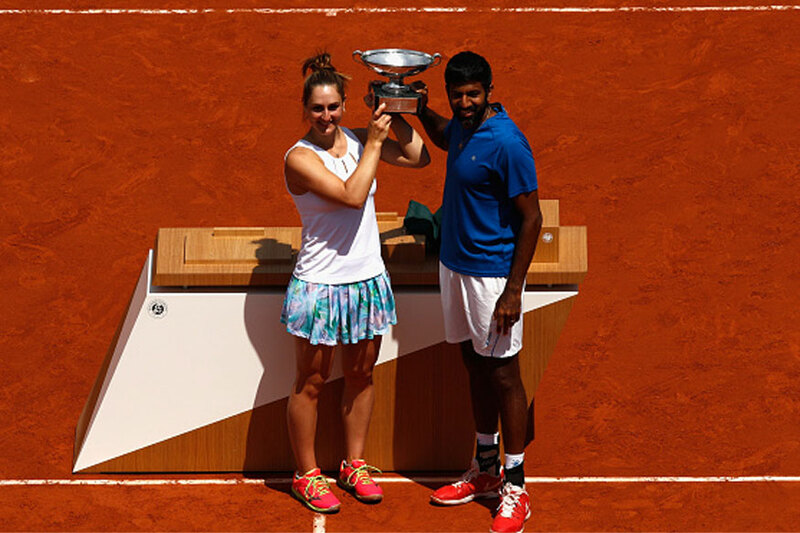 Paris: Rohan Bopanna lifted his maiden Grand Slam title by winning the French Open mixed doubles trophy with Canadian partner Gabriela Dabrowski, becoming only the fourth Indian ever to clinch a major, here on Thursday. Bopanna and Dabrowski, seeded seventh, won the title following a stunning turnaround in the final. Playing only his second Grand Slam final, Bopanna and Dabrowski saved two match points to eke out a memorable 2-6, 6-2 12-10 win over Germany's Anna-Lena Groenefeld and Colombia's Robert Farah. Bopanna and Dabrowski were down by two points but Farah and Groenefeld muffled the chances. Bopanna and the Canadian then had two match points and they sealed the championship when the German double-faulted while serving at 10-11. This was only the second time in his career that Bopanna had reached the summit clash of a Grand Slam. In 2010, he had made the final of US Open with Pakistani parter Aisam-ul-haq-Qureshi and lost to the legendary Bryan brothers -- Bob and Mike. Only Leander Paes, Mahesh Bhupathi and Sania Mirza have won Grand Slam trophies for India. Dabrowski blinked first as she lost serve on the deciding point with Farah easily smashing past Bopanna on an overhead volley, set up after a rally. Anna-Lena Groenefeld, who celebrated her 22nd birthday last Sunday, then made it 3-1 with an easy hold. Bopanna, feeling the pressure, hit a forehand long to be be down by two breakpoints in the fifth game but managed to save both with the Canadian showing good skills at the net. Farah though remained solid in his service game, never allowing the seventh seeds to put pressure on him. Serving at 2-4, Dabrowski felt the heat and was broken at love when she hit a backhand long. It allowed Groenefeld to serve out the set and she did it with remarkable ease. Bopanna began the second set with a double fault but managed to hold his serve even as he argued with the chair umpire on a line call. The desperation was palpable and it had a debilitating effect on the seventh seeds as Dabrowski yet again failed to hold serve early in the second set. However, Bopanna and his Canadian partner got a fresh lease of life when Groenefeld dropped serve at love in the next game. It only got better for them when Farah was also broken in the sixth game, putting Bopanna and the Canadian ahead 4-2. Dabrowski held her serve for the first time in the match. The German hit a forehand on to the net on Bopanna's return to be down by a set point. She saved that but lost the deciding point and it was one set apiece. In the match tie-breaker, Bopanna and Dabrowski opened up a 3-0 lead but lost five points in a row to trail 3-5. At 5-5, Farah in his attempt to pick up a half volley, ended up being hit on his right eye on the rebound. After a see-saw battle the Indo-Canadian pair emerged champions.